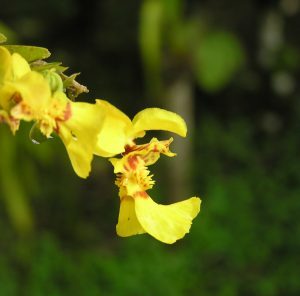 This is an unusual Central and South American member of the Oncidium family . 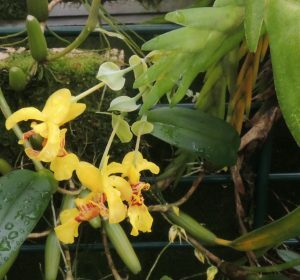 It grows long stems of overlapping short pointed leaves similar to a group of unrelated Dendrobiums for Asia. The clusters of long lasting flowers emerge from between the leaves and several year’s stems flower together. We have seen this species growing in wet evergreen forest along rivers in Costa Rica at 1400m altitude but it can be found up to 2600m from Mexico in the north to Colombia in the South. We grow this species mounted and in pots but mounted plants present best as the stems develop a pendulous habit over time.